Offering American Escrima & Jiu Jitsu See the Difference Real Karate Makes!!! Shorin-Ryu Shorinkan Karate & Jiu Jitsu! Hughes Karate-do offers Kids karate classes for kids aged 5 and up. We provide a structured yet fun environment for learning Karate that helps children build their concentration, physical ability, and confidence. Our Little Tigers class is for the smaller kids just starting out. Our emphasis is on basic stances, movement, avoiding attacks, punching and kicking. The child is introduced to kata with “Basic form #1”, and continues to grow with other kata such as Naihanchi and Pinan. These are the same kata the adults learn, with applications appropriate for young minds. We teach basic self-defense techniques against various attacks which are simple and easy for the smallest child to learn, while also providing realistic self-defense applications. Everything we teach the children is solidly grounded in traditional Okinawan Karate, so as they grow up and continue to train they learn increasingly sophisticated applications for every basic move they learned when they were smaller. Intermediate children continue to build on the basic foundations. 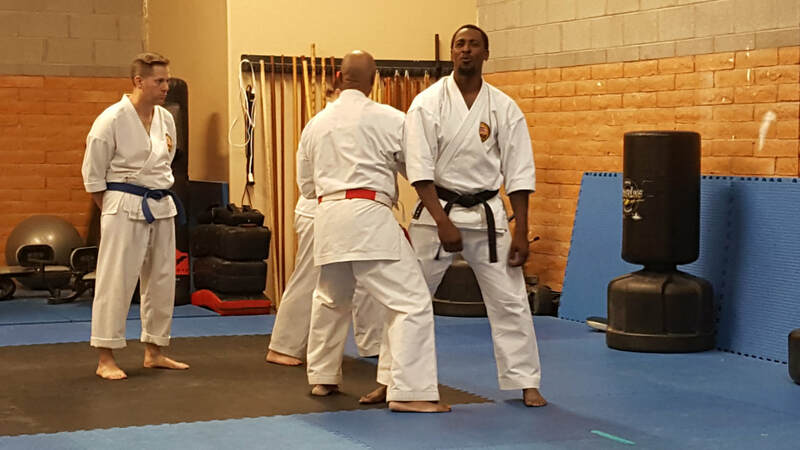 The emphasis is on polishing their techniques and growing a more thorough understanding of fundamental karate principles. These kids spend time on developing strong kicking and punching techniques, learning how to fall without being injured, and light, realistic sparring. Study of kata continues, with more difficult kata being introduced and practiced. Children learn more applications for the moves in the kata, and practice on each other. Older kids and teens receive training that is similar to what the adults receive. Some kids, depending on skill level and maturity, may train with the adults. We are very mindful of the serious nature of what we study and are careful to temper what we teach when younger kids are around. Even leaving out some of the more joint-crunching concepts that the adults study, the older kids still receive a rich grounding in the fundamentals of Okinawan karate. Kids in adult classes Intermediate and upper rank children may train at the same time as the adults at the discretion of Sensei. Youngsters in the same class as adults learn the same techniques as the adults are learning, but the applications are typically very different. One application taught to the children may be a throw or arm bar, while for the adults it is an arm break. 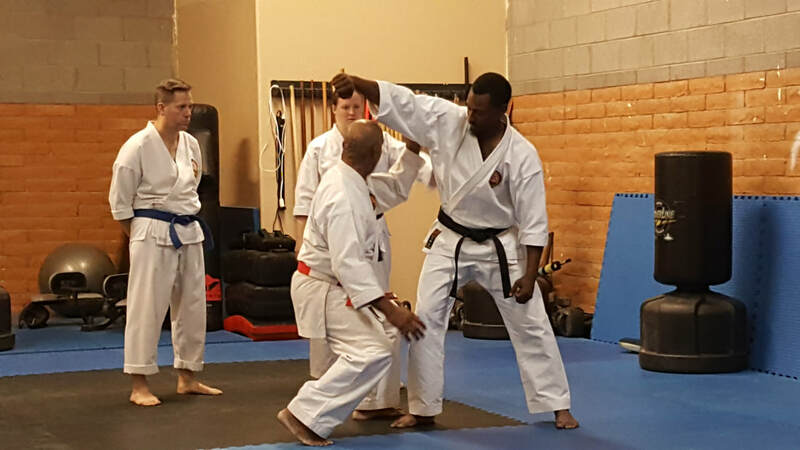 Okinawan karate is a combat art and we realize that it would not be proper to teach true combat applications to persons who lack the maturity to handle the responsibility. That said, having the older kids train with the adults is a great way to expand everyone's horizons. The kids get positive role models and are excited to be learning the "adult stuff". The adults get to work with the youngsters and help them through the beginning-level applications, which improves their mentoring skills (and shakes loose what may be some crusty techniques that have not been practiced for a while). NOW 1000 sq. ft. of Grappling Space!!! 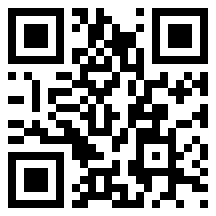 Come check Us out and see how real karate can make all the difference. Copyright © 2011 Hughes karate-do LLC. All Rights Reserved. Designed by AmandaSmith.Co. Copyright © 2011 Hughes karate-do LLC. All Rights Reserved. Designed by Network Consulting Contractors LLC.